Older women who eat dark chocolate once or twice a week could be lowering their risk of heart failure, says a US study. It found those eating chocolate once or twice a week cut the risk of developing heart failure by a third, but those eating it every day did not benefit. The Boston study, in a journal of the American Heart Association, looked at nearly 32,000 Swedish women aged between 48 and 83 over nine years. 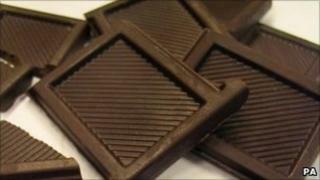 Dieticians say eating chocolate too often can be damaging and unhealthy. The study notes that one or two 19 to 30 gram servings of dark chocolate a week led to a 32% reduction in heart failure risk. This fell to 26% when one to three servings a month were eaten. But those who ate chocolate every day did not appear to reduce their risk of heart failure at all. The researchers conclude the protective effect of eating chocolate reduces as more or less is eaten than the optimum one to two servings a week. Too much chocolate is unhealthy because it contains high levels of sugar and fat which can make people put on weight, the researchers say. But chocolate also contains high concentration of compounds called flavonoids which can lower blood pressure and protect against heart disease, previous studies have found. The researchers behind this study say this is the first time long-term effects related specifically to heart failure have been shown. Dr Murray Mittleman is study leader and director of the Cardiovascular Epidemiology Research Unit at the Beth Israel Deaconess Medical Centre in Boston. He said: "You can't ignore that chocolate is a relatively calorie-dense food and large amounts of habitual consumption is going to raise your risks for weight gain. "But if you're going to have a treat, dark chocolate is probably a good choice, as long as it's in moderation," Dr Mittleman said. Differences in chocolate quality will affect the study's implications, the authors say. Higher cocoa content is associated with greater heart benefits. Although the chocolate consumed by the Swedish women in the study was milk chocolate, it contained a high concentration of cocoa solids - about 30%. This is equivalent to dark chocolate by UK standards. Dark chocolate can contain as much as 75% cocoa while standard milk chocolate may have 25% or less cocoa. Victoria Taylor, senior dietitian at the British Heart Foundation, said the study showed the importance of finding the right balance in our diets. "Before you rip open those sweet treats, remember that whilst antioxidants in chocolate may be helpful to your heart, they can also be found in fruit and veg - foods which don't come with the saturated fat and high calories that chocolate does," she said.